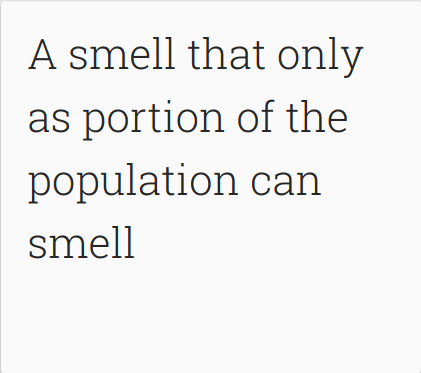 It's a simple enough idea, or in question form: is there a smell only perceptible by some people but not others? There's one obvious example in excreted asparagus compounds. A wonderful 2016 study by Markt et al found that ~40% of those surveyed were able to detect the (for them, at least) distinctive odor of asparagus urine. Don't miss the wild tongue-in-asparagus-filled-cheek speculation by the authors in their Discussion section. Are there other scents in this category? Are there some which are more rarely perceived, perhaps by only 10 or 1 percent of the global population? This may be a difficult question to answer unless the sensory difference correlates with something medically relevant, like a concurrent loss of some other ability or function. We could start with schizophrenia: individuals with this condition frequently experience olfactory disruption. There doesn't appear to be any particular odor that's easier for schizophrenia patients to sense. Other conditions, including Parkinson's* and Huntington's disease, have also been found to impact patients' senses of smell. *Though the supporting results may vary wildly across geographic locations due to different cultural familiarity with types of smells. OK, so I'm not working in perfect chronological order here, but this is a particular piece of media I think about often. 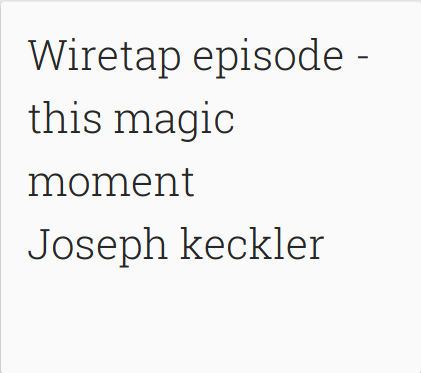 It's an episode of Johnathan Goldstein's long-running Wiretap podcast, and like most episodes, it's a bit of an audio collage. The episode is "This Magic Moment", originally aired December 2014. It's unfortunately not available online in its full form anywhere other than iTunes, as far as I can tell, but the part of this podcast which really sticks with me is a segment performed by multi-talented musician and many-other-creative-title-er Joseph Keckler; the piece ("How Did We Make You") starts as an unassuming recollection but briskly drops off a ledge into an unforeseen existential void. Luckily, that piece is here. Jonathan Goldstein finished the second season of his podcast Heavyweight last year. Heavyweight maintains Wiretap's emphasis on placing people in emotionally awkward situations, especially through Goldstein's own experiences, with varying degrees of exaggeration. I think the first season's second episode, featuring Moby and regret, is a standout. Joseph Keckler has a music project called Train With No Midnight, but if you want to hear any of it, you'll apparently need a copy of the 25th issue of the art magazine ESOPUS. He's on YouTube, too. Not to be taken literally per se. 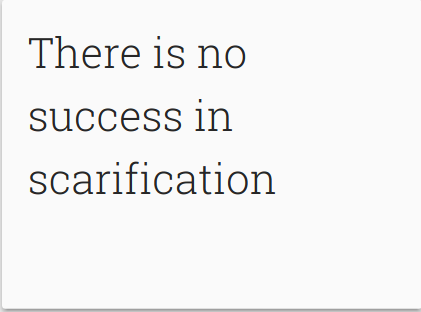 Plenty of aphorisms exist regarding the value of mistakes, yet fewer concern the price of those mistakes. Most of us hopefully don't wander through life seeking pain. That would just be masochistic. It's still fairly easy to subject yourself to incredible stress for years, then survey the damage and declare it was all worthwhile, because how challenging (and therefore, worthwhile) could it have been unless it left a permanent mark on you in some way? Life is hard but it shouldn't be governed by flagellation. Staphylococcus aureus is a bacterial species best known for causing nasty, antibiotic resistant infections (e.g., those involving MRSA or VRSA strains). It's frequently a benign resident of human skin and nasal passages, though depending on geography and other factors, you may or may not be colonized with it. Here, I'll just call it S. aureus, and I'm not referring to any specific pathogenic strain. Bacteriophage 80alpha is a virus capable of infecting S. aureus. Here, I'll call it 80alpha. 80alpha structural proteins get processed during viral assembly. Or, if we think of these viruses as Ikea furniture, this is one of those designs in which some of the parts have to be trimmed a bit to fit together properly. A bunch of 80alpha virions, complete with capsid (or head) structures, tails, and baseplates (those are harder to see; the arrow indicates one seen head-on). Image from Spilman et al. (2011) Journal of Molecular Biology. The 80alpha genome doesn't appear to code anything allowing the virus to make those essential cuts. That suggests that its host S. aureus cell provided the necessary enzyme (or, to continue the Ikea metaphor, you're assembling furniture in a friend's house and have to borrow their table saw. Or, to better represent the bacteriophage vs. bacterial host relationship, you steal it out of their garage). As another clue, the sequence of the 80alpha proteins being cut is a close match to a sequence in S. aureus ribosomal protein L27. So if there's an enzyme that 80alpha sneakily borrows for its own purposes, does S. aureus normally use that enzyme to process its own ribosomal protein L27? Spoiler: yes. This was not previously known to be a common phenomenon among bacterial ribosomal proteins. L27 occupies a rather crucial location in the middle of the ribosome. Recall that ribosomes are the structures in cells responsible for assembling proteins out of amino acids and you'll realize how important it is to have functional ribosomes; ribosomes without L27 don't work terribly well, especially if that extra little bit on the end (the one with the similar sequence to the 80alpha protein, as noted above) doesn't get removed. To make matters even stranger, the extra sequence on the end of L27 is present in S. aureus and many related bacterial species, but not in E. coli. This suggests there's a solid evolutionary reason why the extended protein has been kept around in some bacteria but not others. The "why" part remains unclear, but seeing as this L27 processing is essential to the survival of S. aureus and other potential bacterial pathogens, it may be a good basis for developing new antibiotic strategies. The "eggnog" part here refers to eggNOG, my favorite database of orthologous groups, or clusters of genes with similar sequences. Similar sequence implies evolutionary relatedness, so resources like eggNOG provide a way to see how many branches of the tree of life contain sequences like the gene coding for ribosomal protein L27 or the enzyme responsible for processing it. This doesn't tell us much other than that L27 is broadly conserved - that is, it's seen in a very wide variety of bacterial species. Cyanobacteria, actinobacteria, firmicutes, and proteobacteria are all distantly related but certainly share features like the general structure of their ribosomes. What this doesn't show us is which species have that extended form of L27, like in S. aureus. That's more of a job for a sequence alignment, and we can align the sequences of all 1,660 predicted gene products in this orthologous group. Clustal Omega will do most of the heavy lifting for this sizable alignment but won't distinguish sequences with that extension from others. Luckily we can just guess based on the consensus of the alignment, so after taking a look using Jalview, we see there does appear to be a contingent of sequences (somewhere around 430 out of the 1,660, in fact) with an extra bit on their N-terminal ends. That's the left side here. This doesn't answer the question of which species have the longer L27. We know from previous comparisons that species in the Firmicutes, like Staphylococcus species, generally seem to have the long form while E. coli and its relatives do not. Can we get more specific? Yes - if we trim the alignment down to just the first few amino acids of the N-terminus and remove gap-only sequences, we can then use a taxonomy-based phylogenetic tree builder to see how diverse this set of species is. I've previously used phyloT for this purpose but they recently switched to an unfortunate subscription-based funding model (though that's preferable to losing the site entirely, I suppose). Luckily the ETE Toolkit treeviewer can handle the same function, as long as we provide it with a newly-constructed Newick format tree. This is such a short sequence that it doesn't really provide the information content necessary for a fine-grained look at possible evolutionary relationships, but we can still compare it to the existing taxonomic groups. The tree is large and doesn't entirely match up with bacterial taxonomy, as expected, but we do see that Streptococcus and members of the Veillonellaceae family, among others, seem to form some solid clades. Again, this sequence is so short that even small differences can really throw off how related we estimate them to be. The full tree is here though I'm not certain how stable that link is in the long term and it will take a while to load. Not terribly readable, I know, but that second green column to the right indicates species in Firmicutes. We can also just cut everything down to the taxonomy IDs and use the NCBI conversion tool to get their human-readable names. The resulting list isn't much to look at, but it tells us that, in addition to S. aureus, 12 other species of Staphylococcus, 60 species/strains of Streptococcus, 33 species/strains of Lactobacillus, and even some more exotic Fusobacteria and Acetomicrobium species have genomes appearing to code for the extended L27. Many of these species are at home in extreme conditions (temperatures or pH, in particular) so we could guess that the extension relative to some species less tolerant of extremes confers a benefit to regulating protein assembly under those conditions. Conclusion: bacterial ribosomal proteins may be more diverse than we may have otherwise thought and may be involved in some neat regulatory functions.